Devotions during Lent have their focus on the humanity of Christ and in particular the Passion and Death of our Lord. We are familiar with the Stations of the Cross and this devotion has taken on many new forms and variations in order to take account of cultural and spiritual needs. Other devotions include the Dolour Rosary, the sorrowful mysteries of the Rosary, devotion to the Holy Face, to the Sacred Wounds of Jesus, and the Jesus Prayer. The reading and meditation upon the Passion of Jesus is strongly recommended during Lent as is spiritual reading. Below, you can find some ideas for Lenten devotions. The Stations of the Cross are often called The Way of the Cross (via Crucis) and the form that we have them today with their 14 stations or stopping places originated in Spain in the first part of the 17th century, and the devotion was very popular among Franciscan communities. 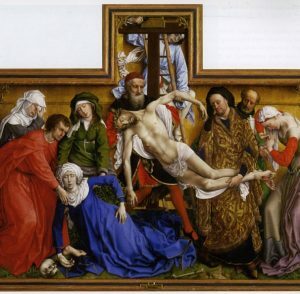 Prior to this time the Way of the Cross was commemorated as far back as the 13th century when St Bernard of Clairvaux, St Boniface and St Francis of Assisi first laid down a form of via Crucis. An opening prayer is used and then as we announce each Station the verse “We adore you O Christ”is said followed by a short meditation and prayer. Silence can also be kept. In between each Station there can be silence, or a verse from a suitable hymn can be sung or said. Verses from the Stabat Mater (At the Cross her station keeping) are often used. At the conclusion of the Stations, there is a closing prayer and it is traditional to offer prayers for the intentions of the Holy Father. These have become more common in recent years, and successive Popes have used biblical formats on Good Friday evening at the Colosseum in Rome. Each stopping place has a biblical reference and so there is no reference to Jesus falling three times, Jesus meeting His blessed Mother or Veronica wiping the face of our Lord. Blessed Dominic Barberi CP, the Italian Passionist who ministered in England during the 1840s and received Blessed John Henry Newman in to the Church, left a devotional work called the “Via Passionis” (The Way of the Passion) in his volumes of manuscripts, which are now housed in the Passionist Archives in Rome. The method of praying the biblical stations is the same as the traditional form, although as in any prayer, one is free to adapt to suit personal use. We adore you O Christ, and we praise you, because by your holy Cross, you have redeemed the world. Jesus goes to the garden of Gethsemane to pray and agonise for us. Jesus goes to meet the soldiers, is betrayed by Judas, and is bound as a vile wrongdoer. Jesus is brought to the tribunal of Caiphas, where he is treated in a barbaric and inhuman way. Jesus is led to trial before Pilate. Jesus is brought to King Herod who insults him and dresses him as a madman. Jesus is led back to Pilate and reckoned of less value than Barabbas. Jesus is crowned with thorns and shown to the people by Pilate as he says “Behold the man”. Jesus is unjustly condemned to death and led to Calvary. Jesus reaches Calvary and is crucified. Jesus in agony on the Cross. The last words and the death of Jesus. The body of Jesus pierced by a lance, taken down from the Cross and buried. with sorrow deep and true. May every thought of my mind this day be an act of love for you. May every cross I bear this day be an act of love for you. May every deed I do this day be an act of love for you. to strengthen us in our mission. resurrection of his Son Jesus Christ.